Portfolio expansion. Sony is currently launching a torrent of new Xperia models on the market in order to satisfy all conceivable target groups. How will the 4-inch midrange model, featuring a clock rate of 1 GHz and a 512 MB working memory, fare in our tests and is the RRP of 239 Euros (~$323) reasonable? The manufacturer advertises the Xperia J with the slogan "Big Screen Entertainment". Comparing the screen diagonals of the Xperia J and Samsung's Galaxy Note 2 (4.0- vs. 5.5-inches) makes clear that such statements always have to be seen subjectively. The Xperia J's screen looks rather small in a direct comparison. However, we will disregard the device's appearance for the moment. 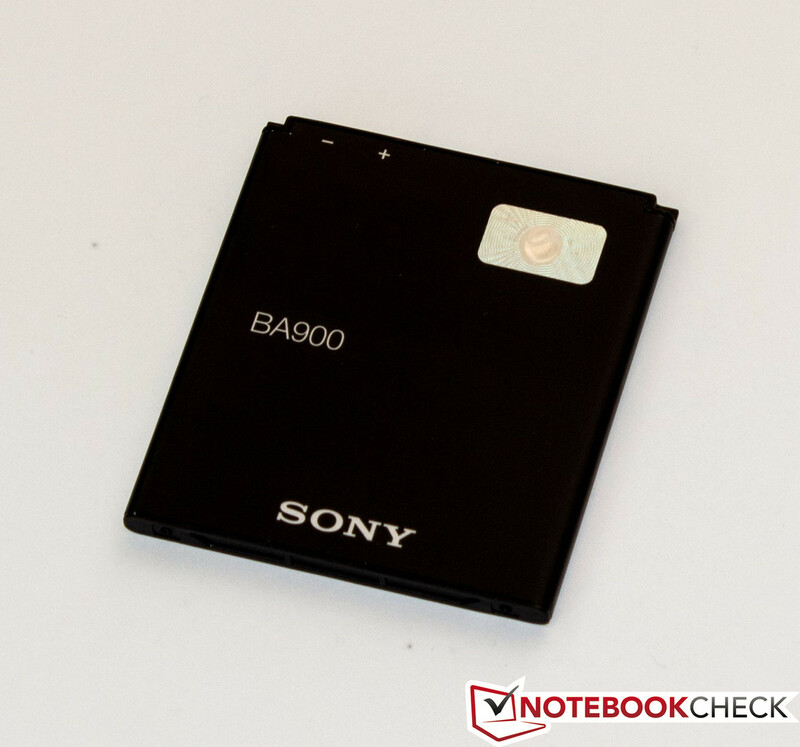 Sony's slogan is not very revealing when it comes to the power of the used hardware - and this is where notebookcheck.net comes in. The Xperia J is powered by the same SoC (system-on-a-chip) as Samsung's Galaxy S DUOS, which is the Snapdragon S1 MSM7227A with a clock rate of 1 GHz. It is supported by 512 MB of working memory. The installed GPU for rendering content on the 4.0-inch TFT touchscreen is dubbed Adreno 200. 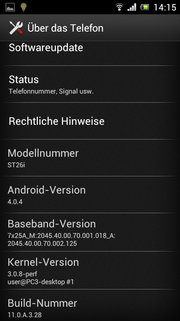 The hardware runs on Android version 4.0.4. 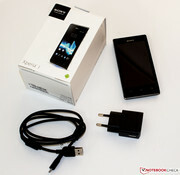 The tech specs already reveal that the Xperia J is not striving for a place among the high-end devices. The manufacturer's RRP of 239 Euros (~$323) underlines this even more. The casing consists of three parts, all made of polycarbonate. The display bezel is covered in black piano paint and juts slightly over the screen so that the latter does not directly lay on the touchscreen when turned around. As is usual with glossy black plastic, fingerprints are inevitable. The casing's center part is a colored contrast to both other enclosing parts. Fingerprints are also an issue for the high-gloss chrome edge. The matte plastic back cover features a slight bulge, which allows holding the entire smartphone comfortably. The "soft curves" of the Xperia range might be preferred to the very angular design of Apple's latest devices. 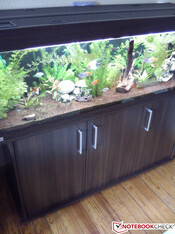 Overall, the casing exhibits good workmanship and is rigid to the largest extent. The touchscreen only yields marginally under selective pressure. 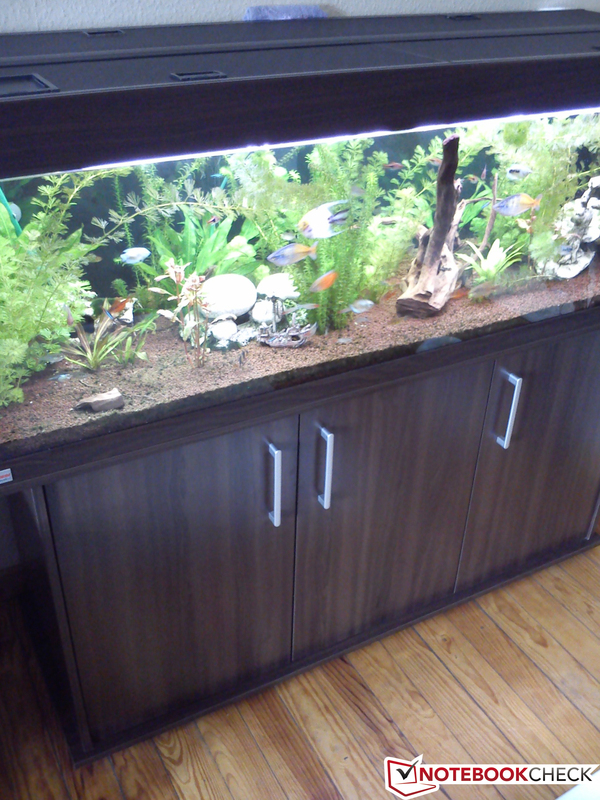 Considering the price, this is a good result in terms of build quality. Nevertheless, the buyer should not expect the build of an iPhone 5. Using plastic usually results in a lower total weight. However, the Xperia J's weight of 124 grams cannot quite compete with the contenders. HTC's Windows Phone 8S weighs 113 grams with an equal screen size of 4.0-inches and Samsung's Galaxy S DUOS weighs 120 grams. The reference in terms of workmanship, the iPhone 5, manages with just 112 grams. The gap gets tighter in dimensions. The Xperia J is quite lengthy at 124.3 x 61.2 x 9.2 mm, but it is a bit thinner than the equally priced contenders. The smartphone is currently available in four colors: black, white, pink and gold. However, we have to mention that all versions feature the chrome edge and piano paint. Just the back cover is exchanged. We did not experience an "Oh" feeling while looking at the button placement. The power button is directly above the volume rocker on the right. In our opinion, both buttons are not sufficiently spaced but that is a matter of taste. The hardware button's spongy pressure point will need more familiarization. This is particularly noticed on the power button since there is no physical home button, like in the Galaxy S3. Also, the button is inserted deep in the casing and is not particularly big. The 3.5 mm headphone jack is located on the casing's top and the micro USB port on the left. The smartphone was immediately identified when connected to a PC. 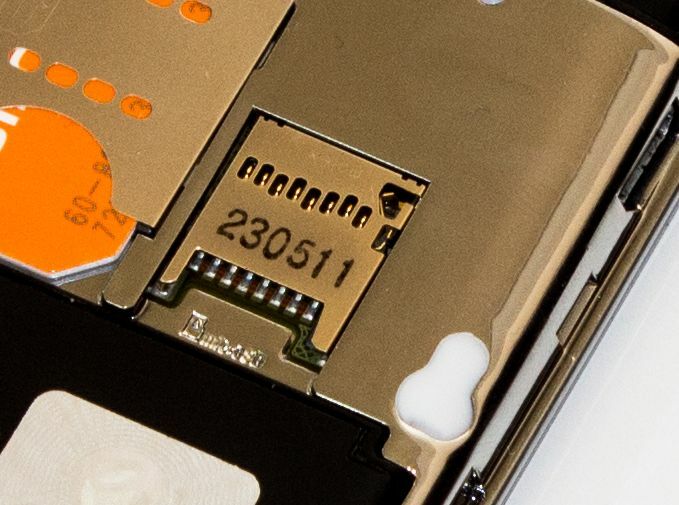 The microSD slot is underneath the back cover and is to support cards with up to 32 GB. This slot is essential since the internal memory only has a gross capacity of 4 GB and net 2.01 GB. The Xperia J also sports a message LED. 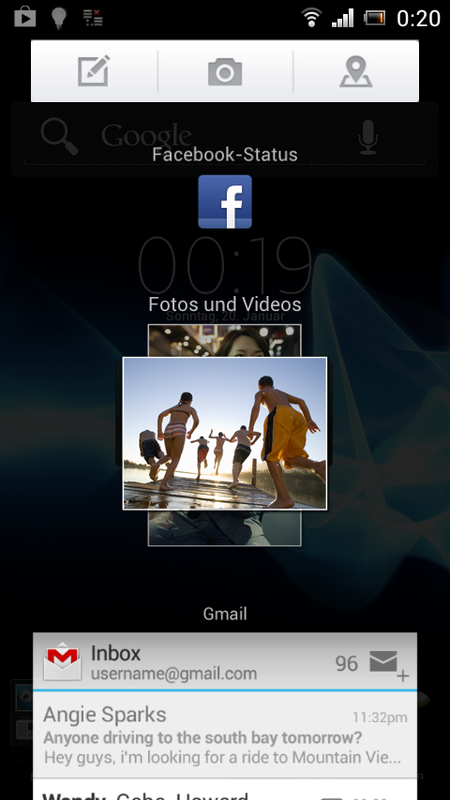 Sony delivers the Xperia J with Android 4.0.4, aka Ice Cream Sandwich. 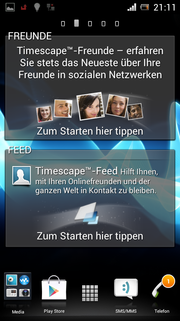 The standard launcher has been modified a bit, but the home screens already feature a lot of widgets. Sony also installs quite a bit of bloatware in the form of apps, such as "LiveWare Manager", "Music Unlimited" and "Walkman". 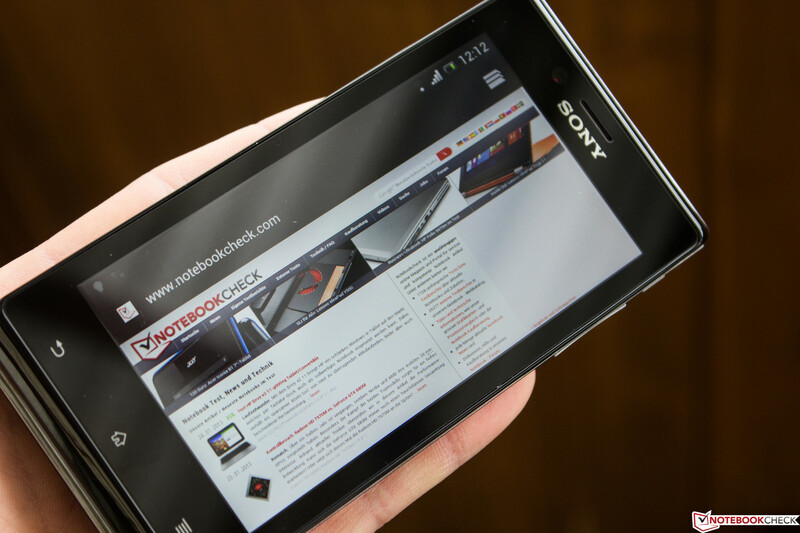 According to Sony, an update to Android 4.1 is planned in the first quarter of 2013. It is currently unknown if or when operating system updates will be released. 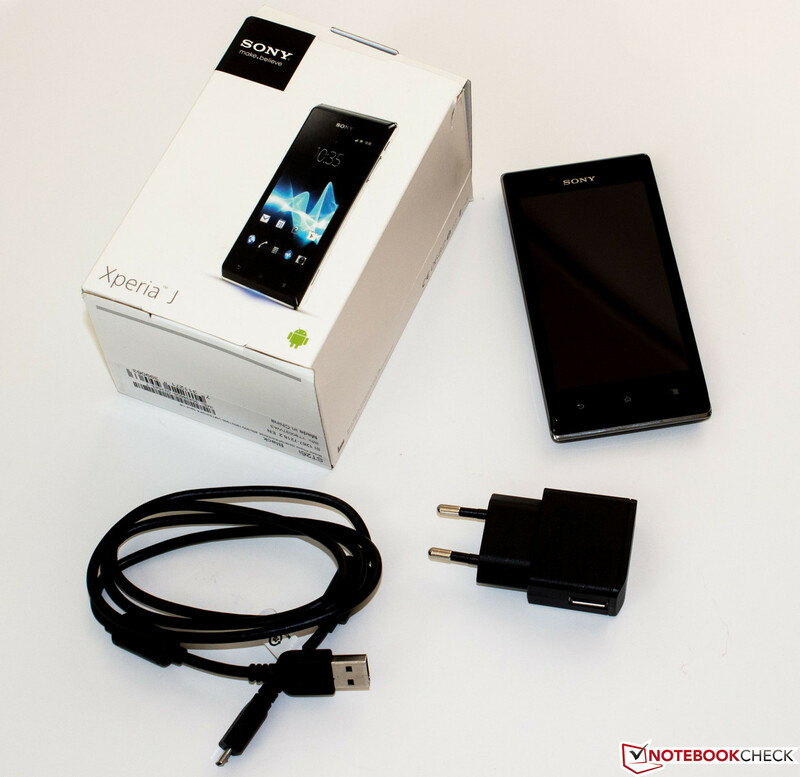 The Xperia J sports a Wi-Fi module that transmits in the 802.11 b/g/n standard and is also certified in accordance with the DLNA standard. 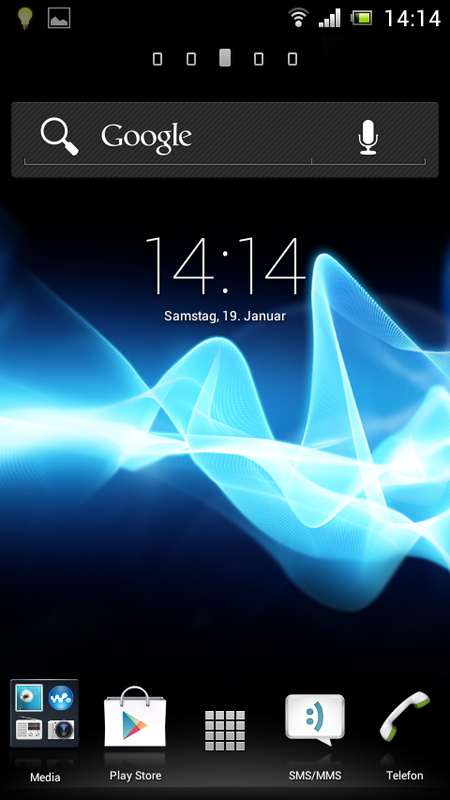 Mobile internet is possible via HSDPA with 14.4 Mbit/s when the user is remote from a Wi-Fi network. The Bluetooth module supports the older 2.1 wireless standard. Devices featuring Bluetooth 4.0 are now no longer unusual. The A-GPS receiver quickly finds a connection to a satellite even indoors in the area of a window. 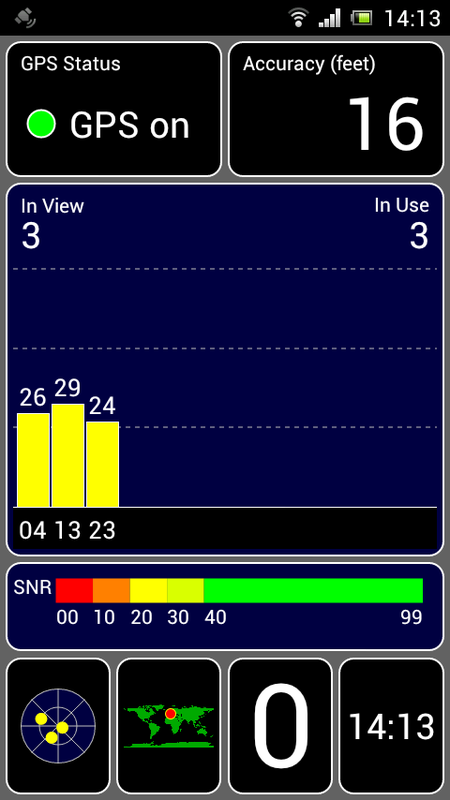 We also did not detect any unexpected signal interruptions during our test. NFC (near-field communication) is not available. The Xperia J sports two moderately sized camera modules. The rear-facing, primary camera has a resolution of 5 megapixels and allows recording videos in VGA quality at 30 frames per second. Samsung's Galaxy S DUOS features the same specs in this field. HTC's 8S primary camera can record videos in HD quality (720p). However, this smartphone does not sport a front-facing camera. 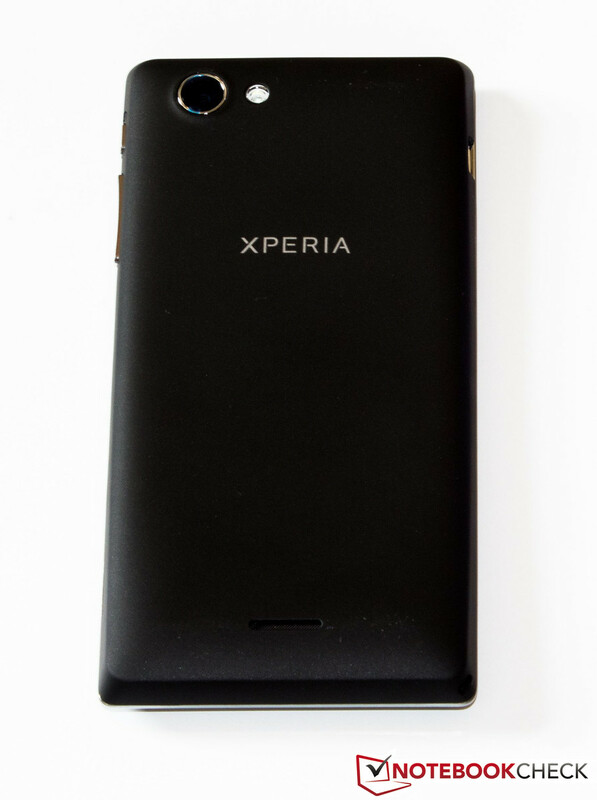 The front-facing camera in the Xperia J is designed as a webcam and should not be used for anything else considering its resolution of 0.3 MP. 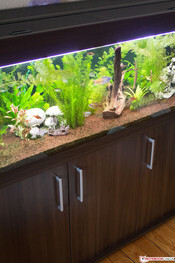 An LED flash is available for low ambient light. Slight image noise was noticed when shooting pictures in weak ambient light. A bluish cast is very evident on all pictures. This affects the color perception massively. 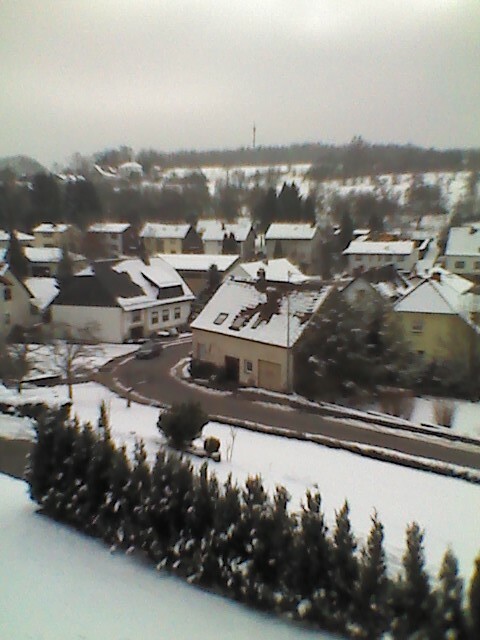 The pictures do not show as much noise outdoors, but the bluish cast remains. Furthermore, all pictures lack sharpness. The front-facing camera is absolutely unsuitable for taking pictures or videos. This camera can be used for occasional video calls when no other alternative is available. The recorded videos only feature VGA quality and thus lack focus. We also doubt whether the camera really supplies the promised 30 frames per second. The smartphone's rather large box awakes hopes of finding a few additional accessories. But this is not the case. 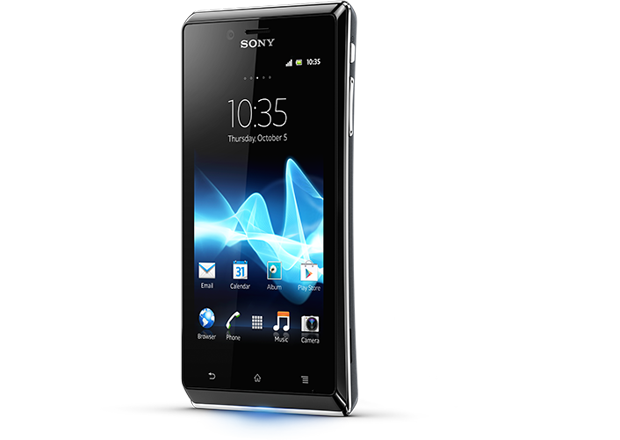 The Xperia J does not stick out from the masses in this point and follows the motto: less is sometimes more. We find various instructions, the battery, a modular charger and the smartphone in the box. The buyer has to waive on an in-ear headset in favor of the low purchase price. Sony's Xperia J's warranty period encompasses 24 months from purchase date and 12 months is included on the accessories. The capacitive touchscreen implements the inputs accurately. The Xperia J also copes well with multi-touch gestures. The screen only detects inputs from two fingers at a time. Navigating through menus and the app drawer is mostly smooth. However, we did notice the odd micro-stutter. There is still enough room when using the virtual keyboard for inputting, scrolling on web pages in the browser or to follow the message history in "Whatsapp" in portrait mode. 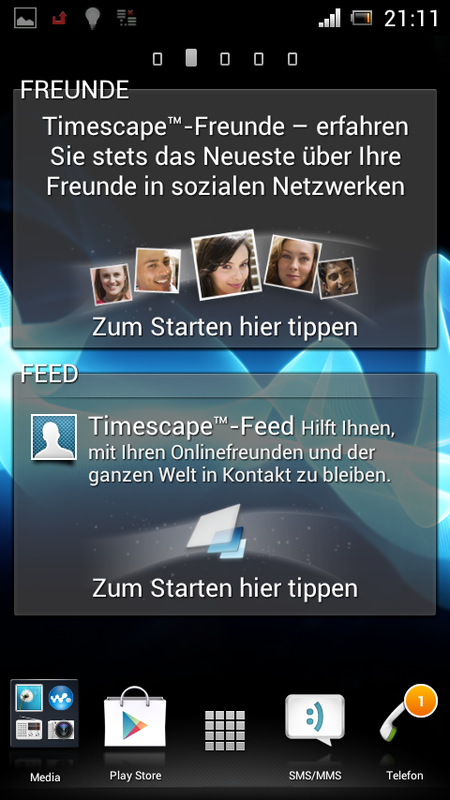 However, the keyboard takes up over 50% of the screen when the phone is used in landscape mode. Only a small gap of the website is seen when the browser's address bar is opened. 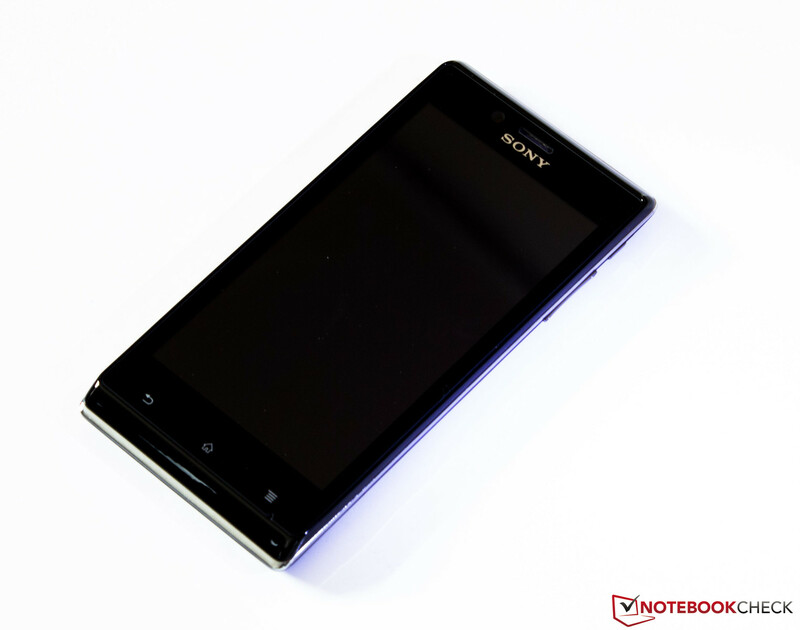 The 4-inch, LCD-TFT touchscreen in the Xperia J has a resolution of 854x480 pixels (FWVGA) with 16.7 million colors. We do not have more specs about the screen's technology. The screen size and available resolution result in a pixel density of 245 ppi. 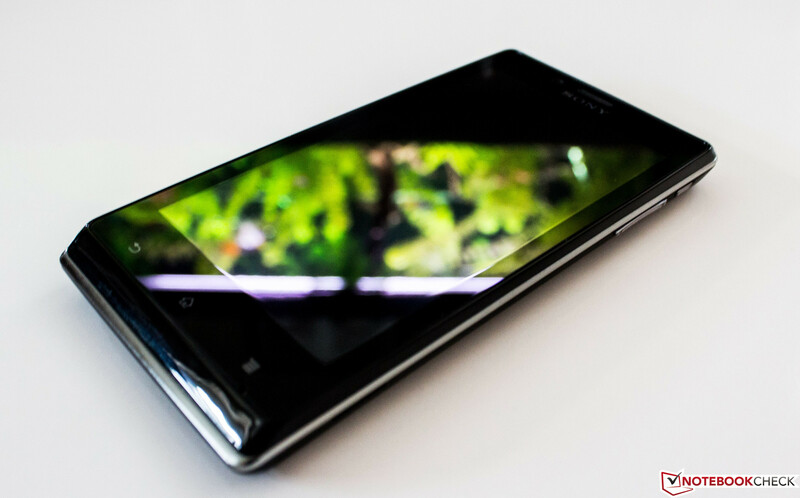 Since the Windows Phone 8S has 54 fewer pixels vertically, it only achieves a pixel density of 233 ppi. We measured a maximum brightness of 347 cd/m² in the lower center using Mavo Monitor. The illumination of 90% confirms our subjective impression of a homogeneous brightness distribution. We ascertained an average brightness of 329.1 cd/m². HTC's 8S achieved an average of 330.8 cd/m² and the Galaxy S DUOS managed a rate of 326.7 cd/m². However, a brightness difference between the three contenders is not visible due to the very similar rates. Conversely, a difference can be ascertained in the black value. 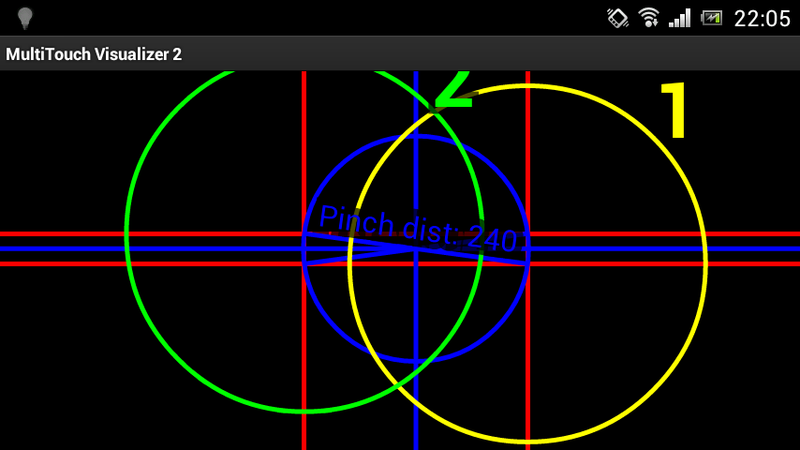 With 0.32 cd/m², the Xperia J can prevail against the Galaxy S DUOS (0.66 cd/m²). HTC's 8S is also defeated (0.41 cd/m²). 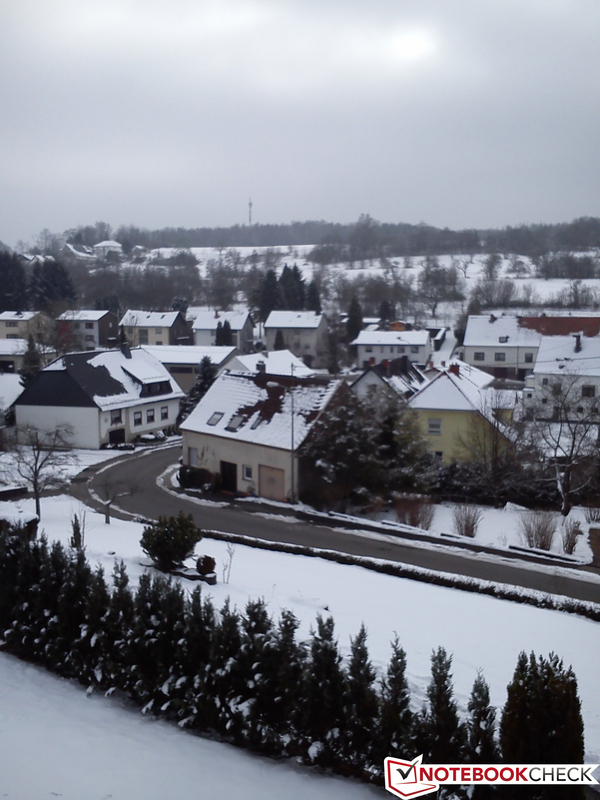 This results in a high contrast of 1050:1, which is even slightly higher than that of the iPhone 5 (1040:1). The smartphone is compelling in outdoor use. 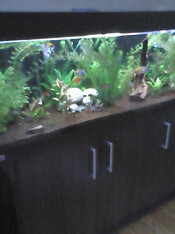 Although the glare-type screen struggles with massive reflections in sunlight, the content usually remains easily legible. This is due to the convincing black value alongside the average brightness rate. 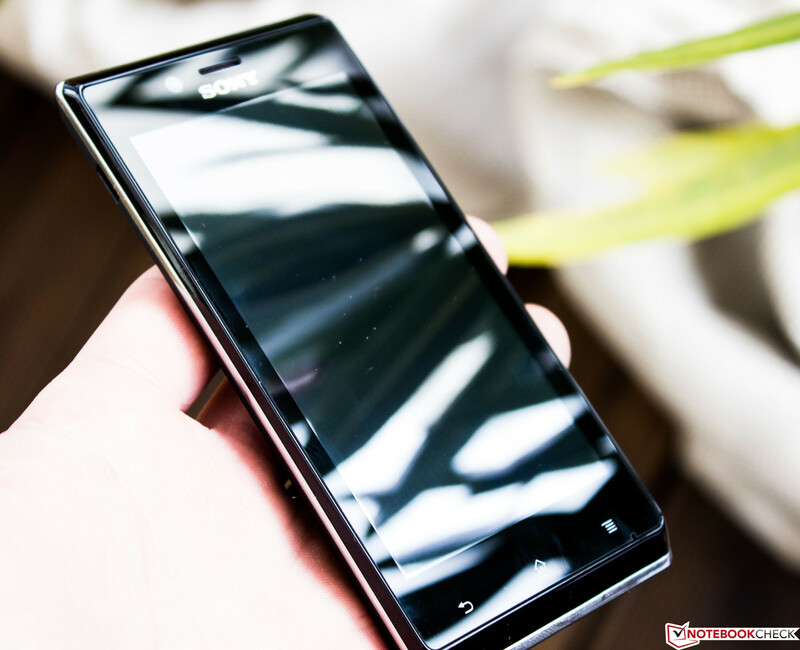 The viewing angle stability of the Xperia J's screen is impressive although it does not use IPS technology. The color reproduction and contrast remain on a consistently high level even up to extremely acute angles. 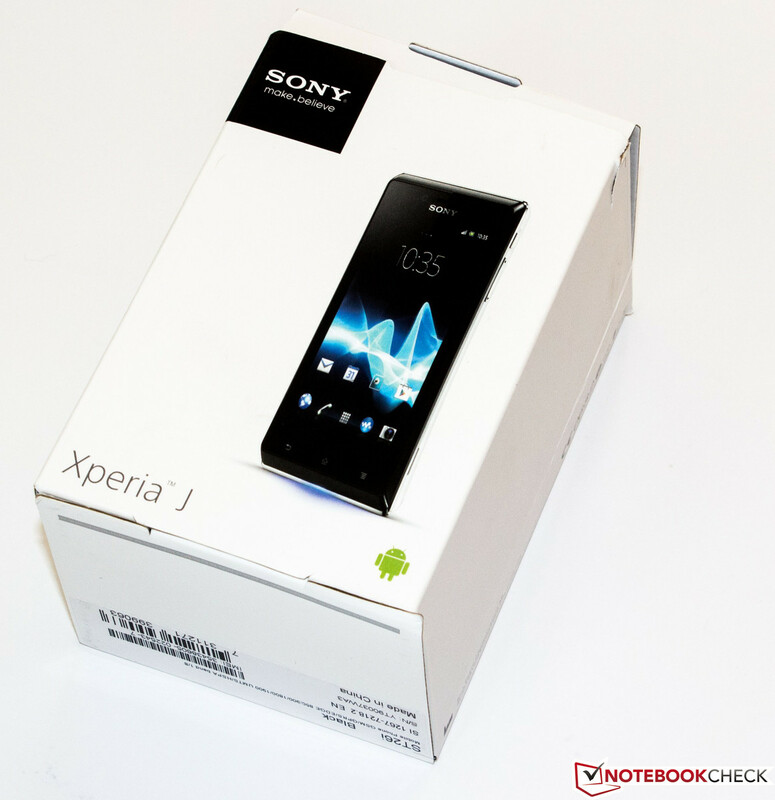 The Xperia J's RRP indicates that the buyer should not expect a high-end device with a quad-core processor, like in Google's Nexus 4. Accordingly, a somewhat older Qualcomm Snapdragon S1 MSM 7227A SoC beats inside. It is based on the ARM v7 platform and the CPU is an ARM Cortex A5 single-core with 1 GHz. The processor was built in a 45 nm manufacturing process and sports the Adreno 200 (Enhanced) GPU. The SoC is supported by 512 MB of working memory. For comparison, current premium devices include a 2048 MB working memory. Samsung's Galaxy S DUOS, which we reviewed, features identical hardware. Consequently, big similarities can be seen in the performed benchmarks. HTC's 8S provides similar specifications, but it uses a completely different operating system and the SoC is from a newer generation. 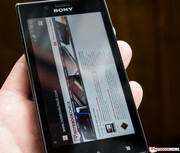 We performed various benchmarks to classify the Xperia J's performance and compare the device with high-end smartphones. The expected result was confirmed in the synthetic benchmarks. 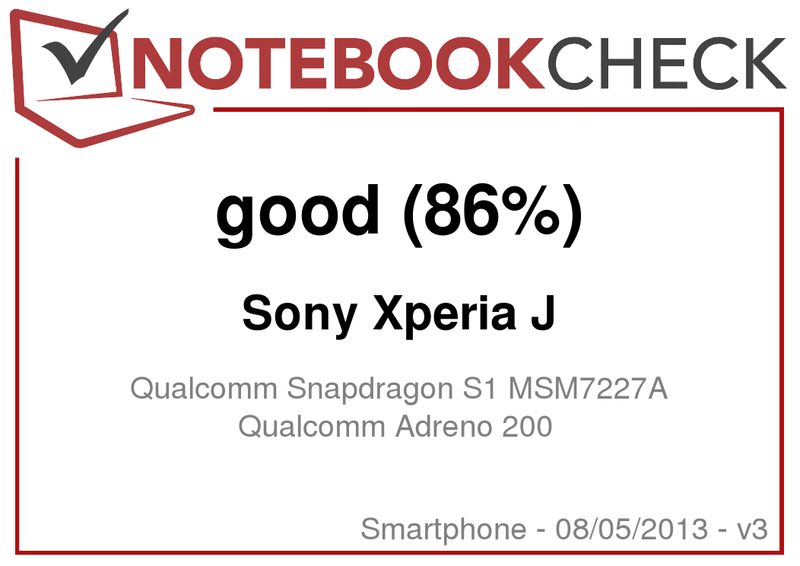 Sony's Xperia J and Samsung's Galaxy S DUOS achieve virtually identical scores in all runs and are miles away from the scores of upper-range devices. We adversely noticed that the GLBenchmark 2.5.1 could not be executed because the system crashed in every attempt. Thus, we cannot supply a result for this benchmark. We also see similarities between the Xperia J and Galaxy S DUOS in the browser-based tests. The test device places itself slightly before the midrange contenders in both the Peacekeeper benchmark as well as Google's latest V8 ver. 7. Sunspider 0.9.1 conveys a contrasting picture because the Xperia J is clearly inferior. Lastly, we used AndroBench 3 for determining the flash memory's read and write rates. The test recorded insignificant theoretical differences in the flash memory performance compared with the Galaxy S DUOS. We did not notice a difference in practical application scenarios subjectively. The difference to the flash memory in high-end devices is not as great as the previously measured computing power difference of the devices. In this part of the review, we examine the error-free rendering of videos that correspond to the high-definition standard. For this, we play four trailers from the device's flash memory: two 720p trailers and two 1080p trailers. The preinstalled video player could not render any of the videos. Thus, we were forced to download an app from the PlayStore. We opted for "MX Player" because it can decode videos via software. None of the selected trailers could be played smoothly. Massive playback delays occurred. Playback was aborted when switching to hardware decoding within MX Player. The trailers' data rate was around 6100 Kbits/s. They were MKV container files in .mp4 format. Newer 2D games run smoothly on the Xperia J. This is also true for many 3D games, although it becomes clear that the SoC quickly finds its performance limits here. 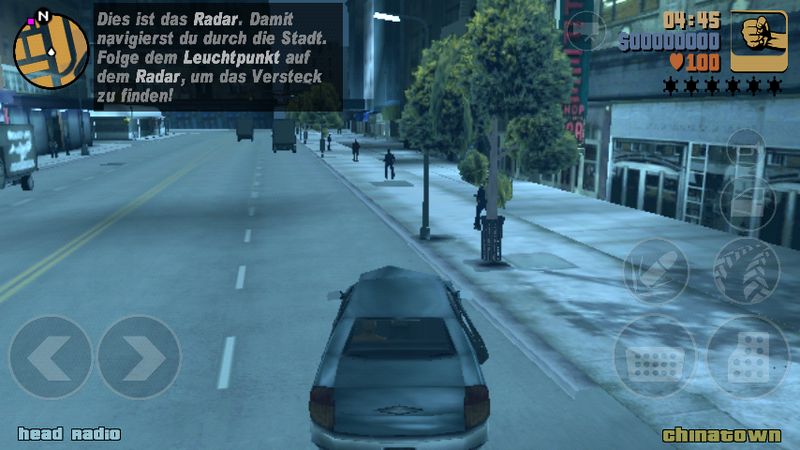 The gaming fun in GTA III is quite restricted because numerous stutters and snags make it difficult to navigate through the streets. Even the lowest hardware settings (minimum details and resolution) cannot prevent occasional reloading. 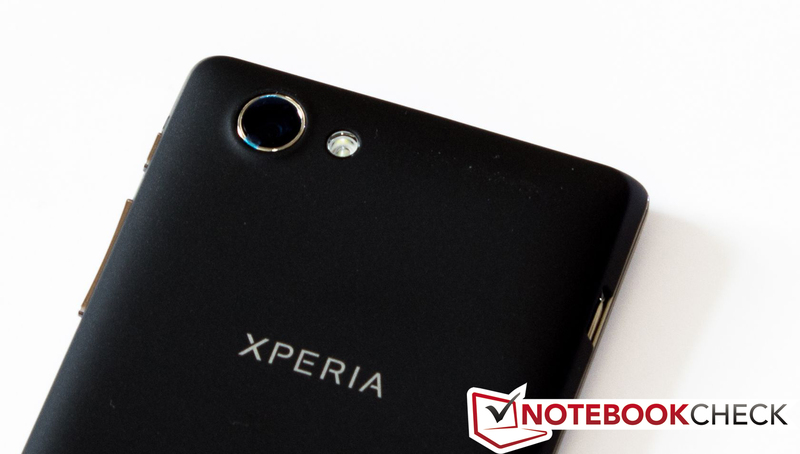 Several test calls confirm that the Xperia J features good speech quality. Both participants hear the partner clearly and very distinctly. Background noise is not suppressed quite as well and makes it a bit more difficult to make calls, for example, in the car (as a passenger). Sony has done a good job with the thermal design. The passive cooling components discharge the produced waste heat well. The device only partially reached 40 °C during load. 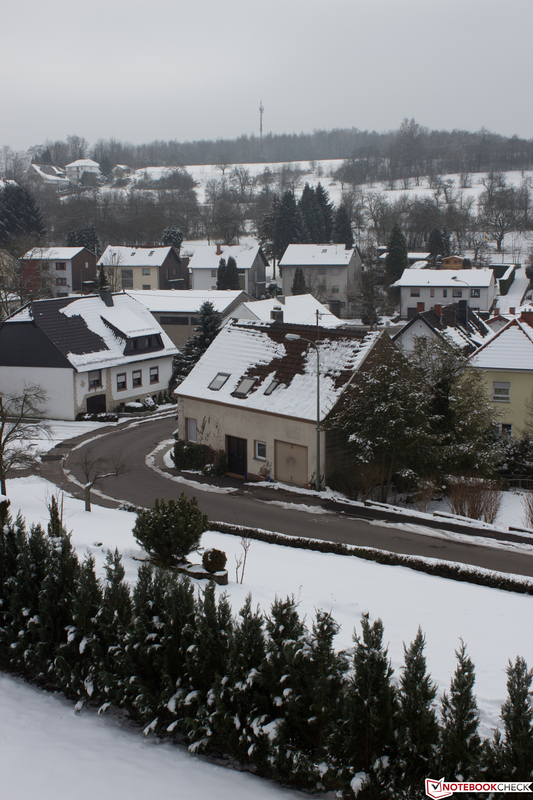 The temperature assessment resulted in a maximum of just 37.2 °C. The equally clocked SoC in HTC's 8S (41.1 °C) and Samsung's Galaxy S DUOS (43.8 °C) reach a noticeably higher rate. 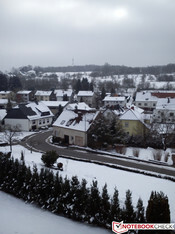 An identical picture is seen in idle. 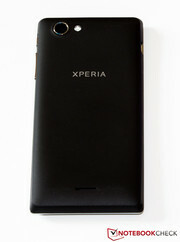 The Xperia J was better than both contenders and exhibited an average of 30°C. The modular power supply unit also reached an absolutely harmless temperature. The midrange model stays cool. The speaker for audio output is, matching the price, unexceptional. The music sounds tinny and vague through all volume levels. We would discourage listening to music in maximum volume - for health reasons. 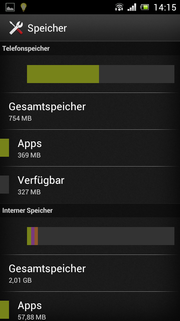 Also, the Xperia J suffers from the same problem as many other smartphones or tablets. When the device is laid on its back, the speaker is covered and the sound distorts extremely. The volume is reduced and the sound is very muffled. 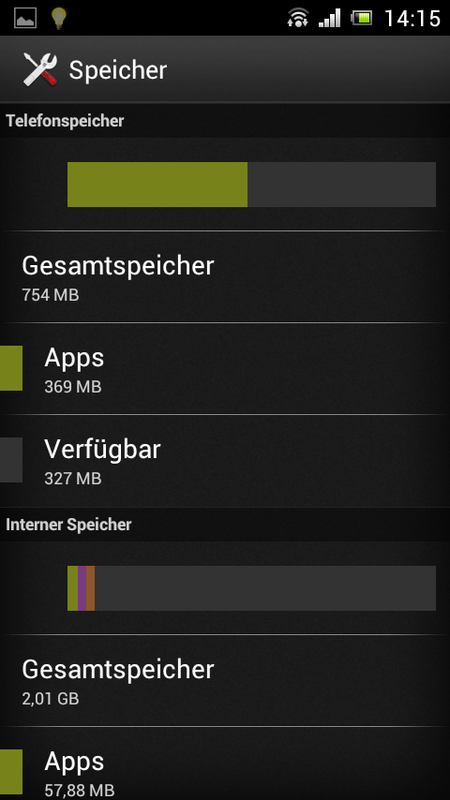 The Xperia J's power consumption is within limits. Our test device consumes much less power than the Galaxy S DUOS. The smartphone was satisfied with 0.3 to 1.1 watts in idle contrary to the 0.7 to 1.8 watts needed by the dual-SIM contender featuring the same hardware. This difference is even clearer in the next part where we look at the battery runtimes. HTC's 8S consumes considerably more power although it sports newer components. We measured 1.2 to 2.6 watts in idle and even up to 4.1 watts during full load. 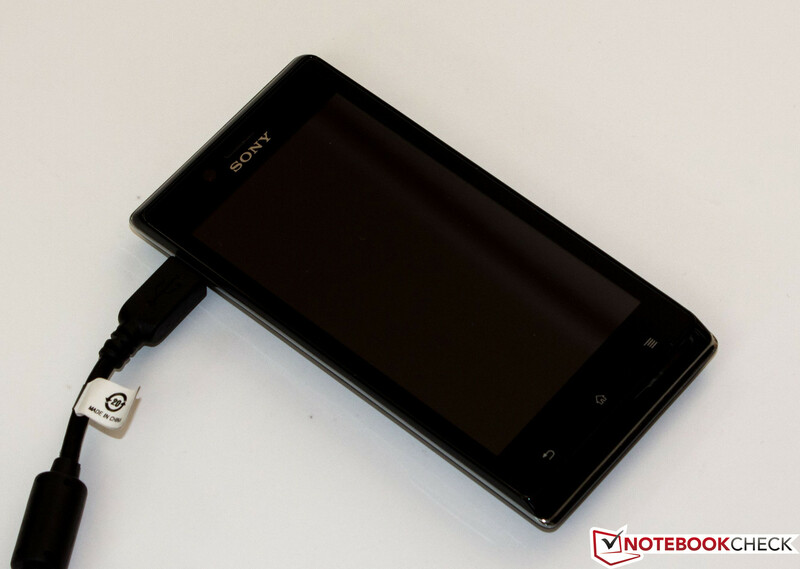 In contrast to that, the Xperia J is a real power saver with a maximum of 2.1 watts during maximum load. 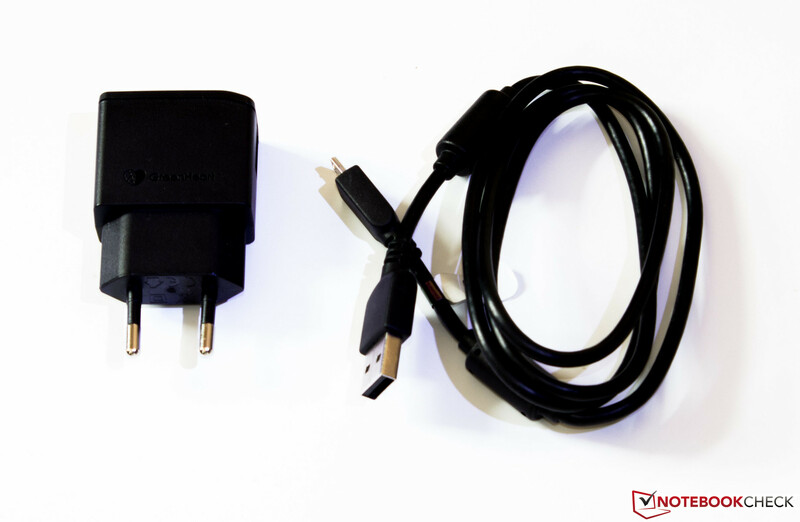 The Galaxy S DUOS' maximum consumption is 2.7 watts in this case. 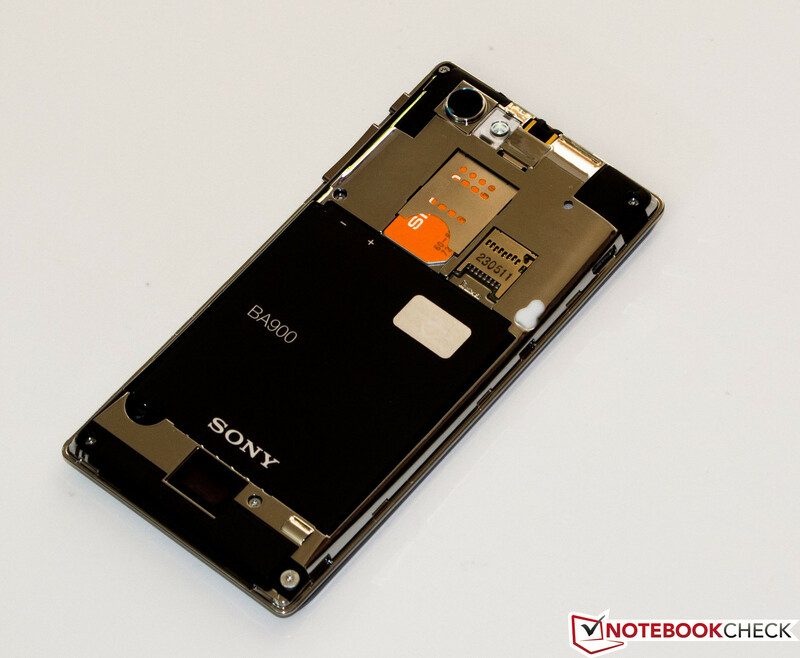 The very satisfactory power consumption of the Xperia J is seen in this part. We ascertained the battery runtime by running four different scenarios. Three tests determine the device's maximum runtime in different situations and the fourth measures the time needed for a full recharge. One parameter for this was an absolutely drained battery. The device was turned on after connecting the power supply unit and set to standby mode. A complete recharge took 3 hours and 20 minutes before the 1750 mAh battery was again ready for use. The battery lasted for a remarkable 5 hours and 21 minutes during full load. The 2:46 hours of HTC's 8S are remote from that. The screen was also permanently on in the idle scenario, but reduced to minimum brightness. The smartphone's screen ran for 21 hours and 30 minutes before it was forced to shut down. This runtime is almost on the record-breaking level of the iPhone 5 (22:20 hours). The screen's maximum brightness is reduced to approx. 50% in the practical Wi-Fi reader test, where browsing on different websites is simulated via a script. Our midrange model achieved 12 hours and 51 minutes here. Neither the Galaxy S DUOS nor the Windows Phone 8S can compete with it in any of the runtime measurements. 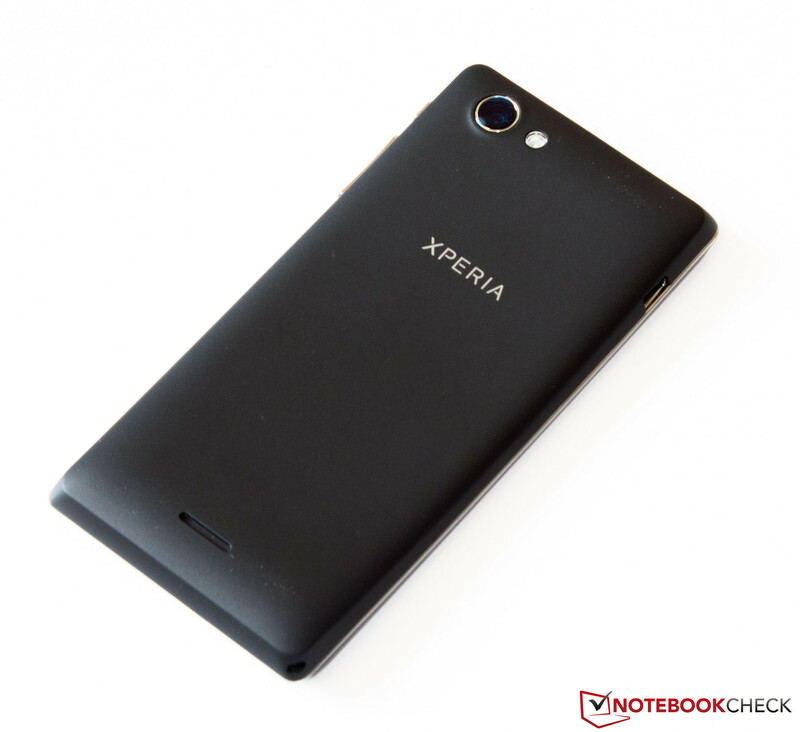 Sony's Xperia J is available for a current RRP of 239 Euros (~$323). It is sold for even less in known internet shops. 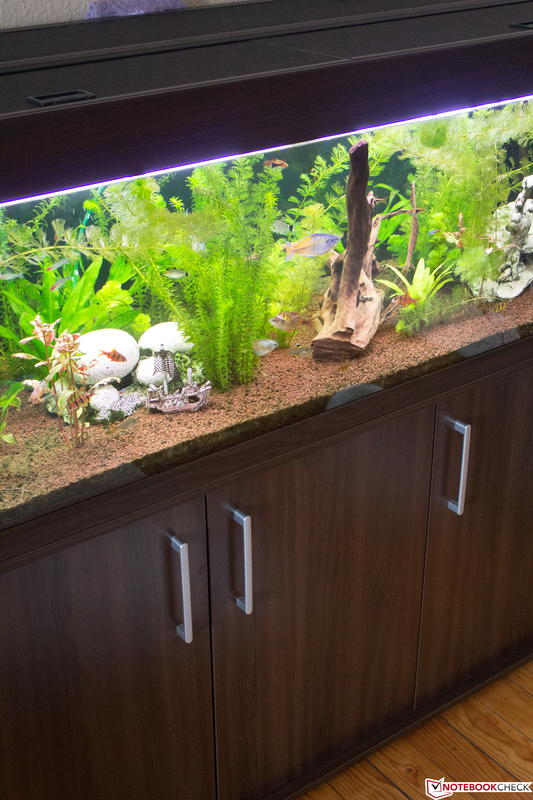 The potential buyer should keep in mind that it will not include the latest hardware and that compromises have to be made for such a "low" price. The 512 MB working memory is quite tight for multi-tasking and the SoC's 1 GHz often finds its limits. This is particularly noticed in multimedia applications. The Xperia J is absolutely overexerted when rendering high-definition movies and only moderate fun evolves in up-to-date 3D games. The camera shoots acceptable pictures in relation to the price. However, it cannot at all replace a digital camera. If these fields of use are irrelevant, the buyer will get a smartphone featuring a solid build and good feel. 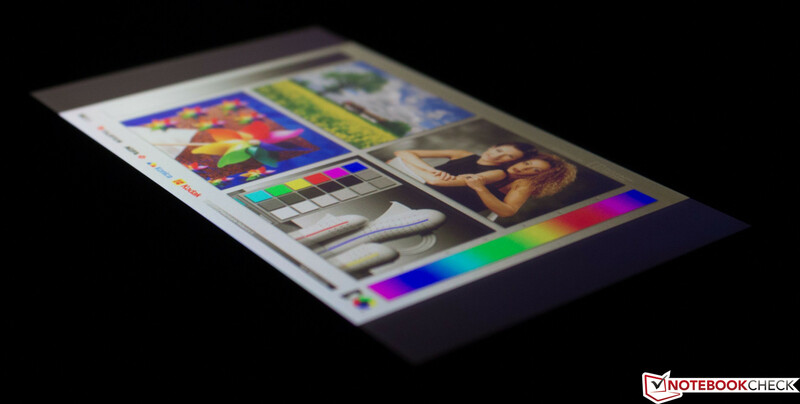 The screen exhibits high viewing angle stability and features good color reproduction alongside a high average brightness and brilliant contrast. The battery lasts for a very long time in moderate use and clearly stands out from the runtimes of the compared models. 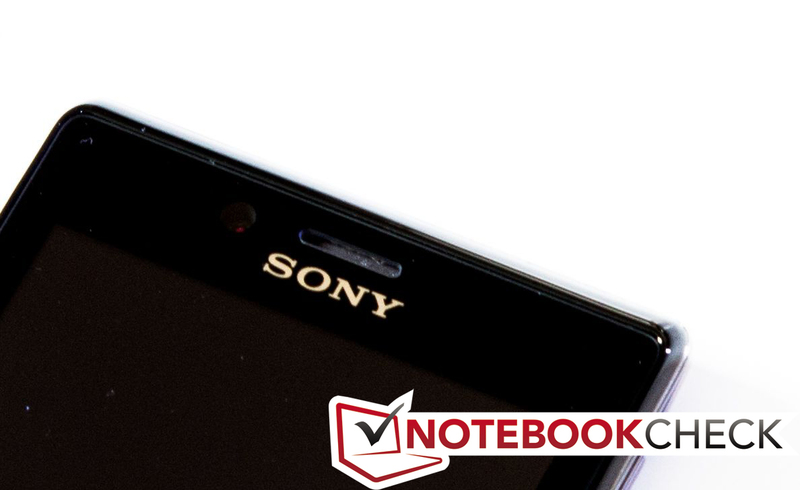 With Android 4.0.4, Sony configures the smartphone with an up-to-date operating system and also holds out the prospect of an update to Android 4.1. The buyer will get an everyday suitable and solid smartphone if clear restrictions in performance and multimedia can be accepted. The speaker is not overwhelming either. A matte screen protector is recommended. of two fingers at a time. 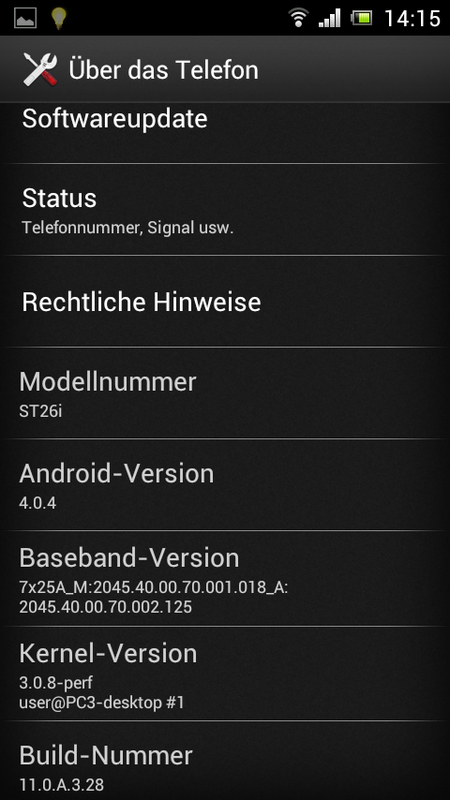 Android 4.0.4 with the prospect of an update. and the front-facing cam does even worse. A normal SIM card is needed. can be expanded via the microSD slot. The screen features a very high contrast at a good average brightness. Also, the screen is very stable in regards to viewing angles and provides good color reproduction even in the slightest angles. A stronger SoC and a bit more working memory so that routine tasks and multimedia applications run more smoothly. The very long battery runtime that is almost on a par with the iPhone 5. It lasts much longer than competing models with the same hardware.